The updated new line of Roush Racing Ford F-150 trucks have been unveiled by the famous American tuning company. 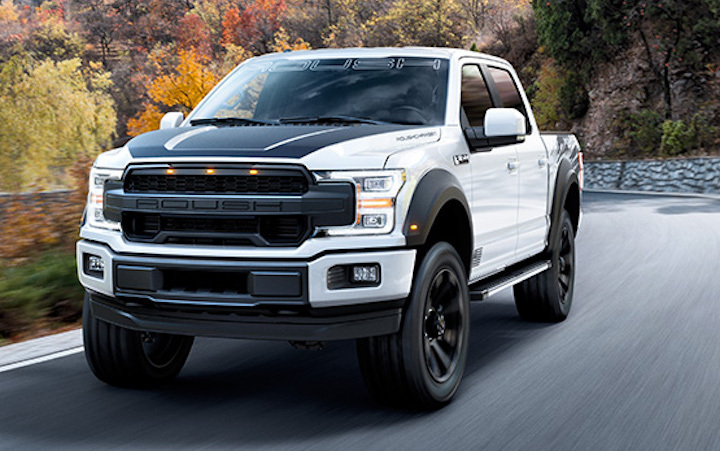 Roush, based in Livonia, Michigan, is offering two tuned versions of the Ford F-150 – the 2019 Roush Ford F-150 SC and the 2019 Roush Ford F-150 Nitemare. The F-150 SC gets an upgraded version of Ford’s 5.0-liter V8 engine with a Roush TVS R2650 supercharger, which is making 650 hp and 610 lb-ft of torque. Roush says this motor provides more than enough power “to handle cross-country highway trips, high-energy trail riding, or towing your boat.”It also gets a side-exit Roush exhaust system with four sound modes (touring, wide-open, sport, and custom), which is controlled via the Roush Active Exhaust mobile app for Apple and Android. A number of suspension upgrades are also on the table thanks to the FOX 2.0 Performance Series Suspension system, which brings a 2.0-inch lift while maintaining the factory capacity for payload and towing. There are also 20-inch Roush wheels shod in General Grabber ATX tires, a custom grille, fender flares, a different front bumper cover and a number of available graphics packages. While the Roush Ford F-150 SC focuses on off-road performance, the Nitemare is focused on the street. It gets the same 650hp supercharged V8 and active exhaust system as the F-150 SC, but looks completely different thanks to a sport lowering kit, a graphics package, 22-inch gloss black wheels, a roush grille and front bumper cover and black trim. While many tuned cars and trucks can be unreliable and may not be offered with a warranty, Roush offers an aftermarket industry-leading 3-year, 36,000-mile limited warranty. The 2019 Roush Ford F-150 SC and F-150 Nitemare are available to order now. For more information and photos on these two new tuned trucks, be sure to visit Roush’s website at this link. I’m hoping that this next gen mustang gets some Roush love as well. I would love a Roush charged hybrid 5.0L AWD mustang. Knowing that Roush specializes in full package vehicles, I’m particularly excited about the upcoming S650 CD6 Hybrid V8 Mustang GT. With a suspected Gen-4 Coyote 5.0L V8 coming for the new chassis mustang (or even something more exciting) We already know the GT500 block, possibly heads and valve train and the GT350 full induction system are coming. Hopefully along with a GT350/GT500 exhaust manifold to free up some more power. As i’ve said before, I’m speculating that not only will the hybrid electric front drive system be used on the S650 AWD GT, but the new 10-speed hybrid automatic driveline and an electric differential will most likely be present on this new V8 GT as well. The Performance Pack Level-2 parts will more than likely show up on the regular GT with new wheel designs (something more modern and probably European) as well as a new exterior and interior that will still have signature mustang styling but will move to a sleeker (more BMW M850i) shape. What I’m wondering is what will Roush do with this new Mustang? Of course I would suspect an aero package (front splitter, side splitter, rear diffuser, rear spoiler, more aggressive fog lamp openings, and possibly a new hood to clear a Roush supercharger system. We already know that Ford’s 10-speed hybrid transmission can hold up to a boosted engine and support 600lb-ft of torque. While I’m figuring a stage-1 package will be styling, handling, wheels, exhaust and interior upgrades (i’m seriously hoping for a return of a mid-muffler exhaust system with resonators on the end similar to what Mopar has on the Challenger/Charger on the new Mustang from the factory), I’m sure a stage-2 Roush S650 Mustang will feature a supercharger system. With the Mustang moving to a new level of sophistication from Pony car to GT sports car, I’m sure if Roush does build a new exhaust system for this car it will most likely be titanium, it just makes sense. Granted I would probably never buy an S650 Stage-2 Mustang because i have no need for that kind of power as i’m figuring the new mustang GT hybrid will probably be making somewhere between 495hp and 510hp and roughly 520lb-ft of torque with an all-wheel drive system. A stage-1 Roush would suit me perfectly where i live in Pennsylvania. Roush is also known for their graphics and with this new mustang, I don’t think the graphics are going to be as extreme. I’m sure there will be Roush badging on the car and maybe lower rocker stripes and the American flag graphics on the rear quarters but that will probably be all. Hopefully Ford will change up the interior a lot and go with more of something like what was in the Focus RS with a more modern look to it but still with a D-shape trim with heating/cooling, this way roush could offer an aggressive alcantara/leather heated/cooled steering wheel. All in all I am looking forward to the new car and hopefully Roush does something cool with this one like they’ve done with every other mustang they’ve gotten their hands on.